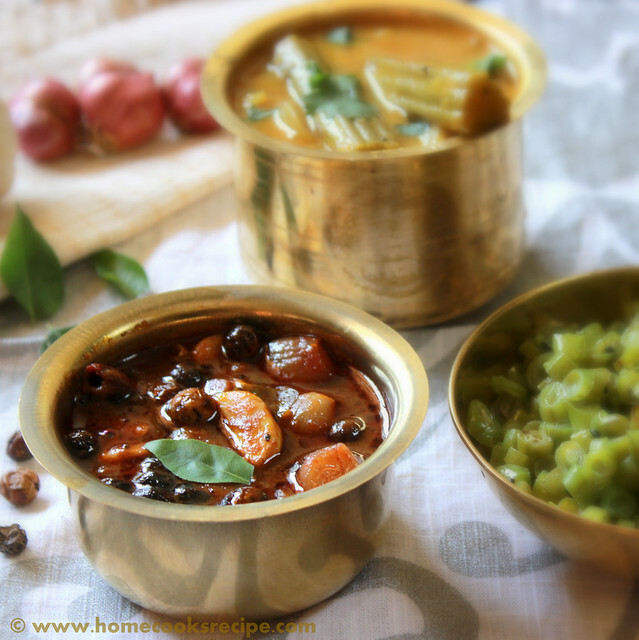 This Vatha kuzhambu recipe is the perfect recipe. Making perfect vatha kuzhambu and mor kuzhambu remained as a dream to me before. Now i have a favorite tutor on youtube, from where i learned to make perfect traditional brahmin style vatha kuzhambu. i have prepared vatha kuzhambu with same ingredients, but now i know, the order in which the ingredients should be put to cook. simple tricks! come on i will teach you, what i learned. The tricks i learned this time is to roast the sambhar powder, before adding the small onions and garlic. next trick is allowing the kuzhambu to boil well and let the kuzhambu leave oil in the sides of the pan. Traditionally vatha kuzhambu is made in kalsatti, it seams the kalsatti made kuzhambu is extra special in taste. Still in many brahmin house-hold, making vathakuzhambu in kalsatti is in practice. When i visited a mess in west mambalam, few people were having curd rice and vatha kuzhambu as the side dish. even i started to eat like that way back home, Its better than eating with pickle! Try for yourself! 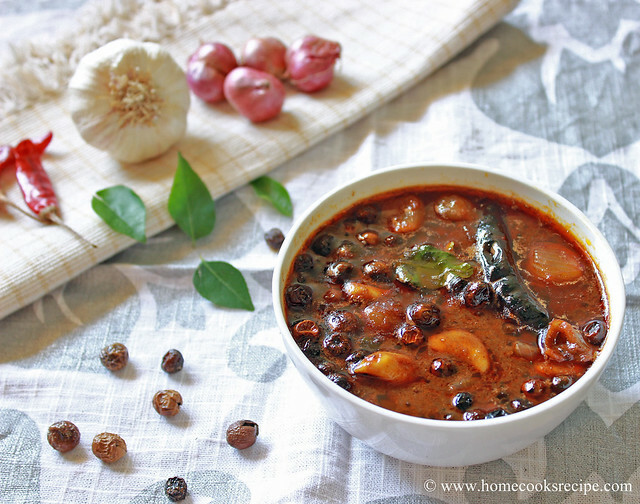 This vatha kuzhambu will be bitter, tangy and spicy. a bit of jaggery makes all the taste get balanced. No wonder, this vatha kuzhambu remains as favorite to many people. 1. Soak the tamarind in 1/2 cup of warm water for about 10-15 minutes. Squeeze the tamarind and get the extract in a bowl. repeatedly add water to tamarind and squeeze it twice. this helps in taste. 2. Peel the outer skin of small onions and garlic and keep aside. 3. Heat a tsp of oil in a small pan and roast the sundakka and manathakkali vathal in medium flame for about a minute. 4. Heat a thick bottomed pan, add 1/4 cup of sesame oil, when the oil is hot, drop in the mustard and let it pop, then add chana dal, jeeragam, fenugreek, dry red chilli, asafoetida powder and curry leaves. 5. Next add in the sambhar powder in slow flame. roast the sambhar powder in slow flame for about 1-2 minutes, till you see change in colour. 6. Then add the small onions and garlic, roast the onions and garlic in slow flame for about 5 minutes, till the shallots and garlic turn soft and cooked. 7. Now, when the small onions and garlic are cooked, add in the tamarind water and some curry leaves. add salt to taste and stir well. let the kuzhambu boil in medium flame for about 5 minutes. 8. The oil should seperate from the curry, only on seeing that, add in the roasted sundakka vathal. Add a small piece of jaggery at the end. again let the kuzhambu boil for about 2-3 minutes. Switch off the flame and serve hot with rice and appalam. Few people like to have this vatha kuzhambu as a side, for curd rice. 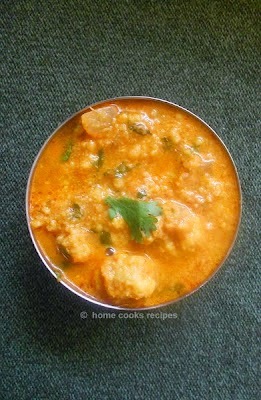 I have added medium amount of tamarind, you may increase to a small lemon sized one, if you prefer more tangy kuzhambu!. 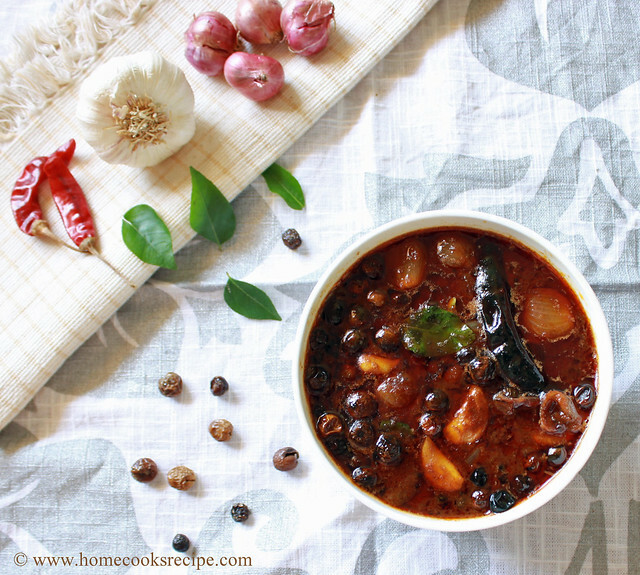 Vatha kuzhambu stays good for 2-3 days in room temperature. 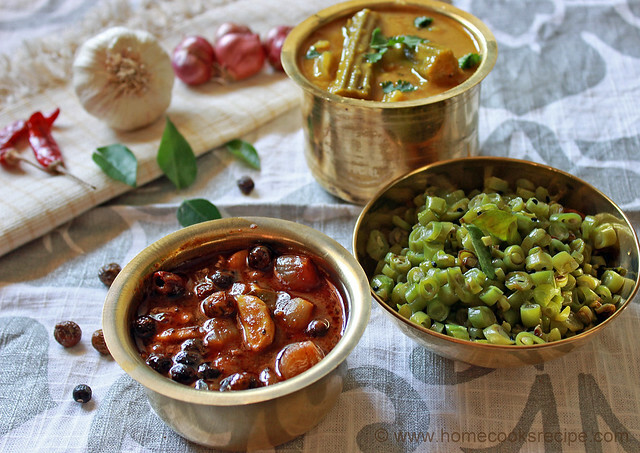 While you want to prepare food for travel, prepare this kuzhambu the earlier night. prepare it little thick. next day, mix the kuzhambu with hot rice and pack for your travel. it should keep well for 6-8 hours. Add little salt to the kuzhambu, as the sundakka vathal and manathakkali vathal has salt in it. so it will get balanced in the kuzhambu. Super, i want that spread now. Lovely props and pictures! Fingerlicking,tangy kuzhambu..Very attractive and droolworthy spread. I love this dish have had in thali back at home etc... but never made them and even if i want to i can't as i don't have that ingridient. Will getnext time when i am in india. 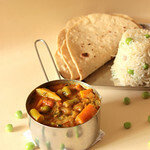 beautiful clicks and looks delicious..
My most favourite recipe!nice clicks! Wow, Tempting kulambu! Great clicks. irresistible and tongue tickling kuzhambu!!! 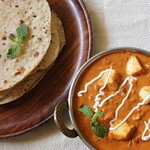 Nice recipe and yummy cause its an Indian dish nice superb post keepit on :D.
Hi , What can be added instead of sundakai vathal ?